"This week's old photo is the first of a series submitted by Dorothy Marks of Bradford, a life-long resident of the town. The photo show the Jack Cook farm implement display in 1911. Many area farmers took part in an annual parade which began at the CNR railway station in those days. Jack Cook was the father of the late Fred C. Cook, and Mrs. Tom Gardner. Mrs. Marks identified the lead driver as Tom McCracken. 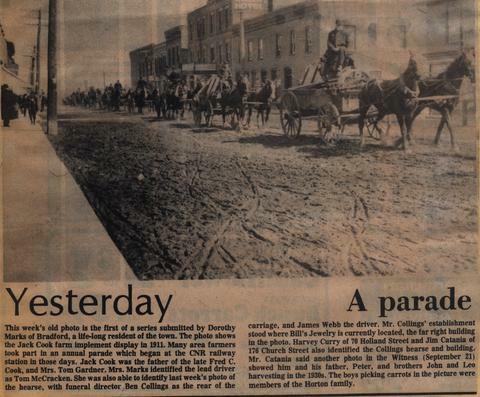 She was also able to identify last week's photo of the hearse, with funeral director Ben Collings as the rear of the carriage, and James Webb the driver. Mr. Collings' establishment stood where Bill's Jewelry is currently located, the far right building in the photo. Harvey Curry of 70 Holland Street and Jim Catania of 176 Church Street also identified the Collings hearse and building. Mr. Catania said another photo in the Witness (September 21) showed him and his father, Peter, and brothers John and Leo harvesting in the 1930s. The boys picking carrots in the picture were members of the Horton family."